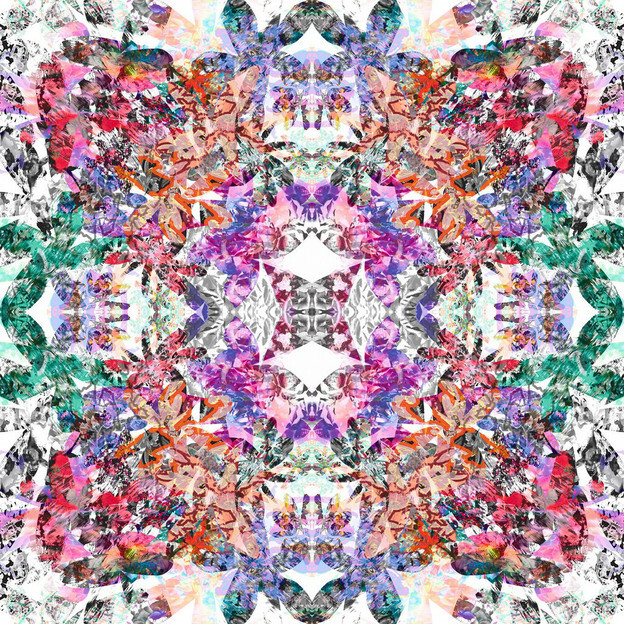 The Dianthus Kaleidoscope scarf was made using flower-shaped cuttings of collages from textiles and hand-painted Indian saris as well as scans of peach and pink-colored roses. From Basically Boutique, http://www.basicallyboutique.com/. From cultural narratives to religion to comic-book characters to conceptions of self, origin stories often serve to explain belief systems and histories within the context of a defined beginning, middle, and end. Origin stories are narrative devices steeped in limitations of both form and content. Even the theory of the Big Bang, the prevailing cosmological model of the universe’s origin that proposes the universe has been expanding from a dimensionless point of extreme density and temperature for 13.7 billion years, is dependent upon axioms that are situated in linear conceptions of time and space, axioms—I have argued in other projects, as have others—supported by Aristotle, who articulated some of the first linear notions of time in response to Euclid’s linear notions of space in geometry, and expressed in Western science through Isaac Newton’s classical mechanics. The vague thinking of theories that rely upon linear notions of space and time is a failing of imagination, rationality, and scale, as I see it, for when we explore beyond eye level to astronomical and molecular scales of physical reality, spacetime is not linear, and ordinary language does not suffice. Diane Samuels hand-transcribed Gertude Stein's The Autobiography of Alice B. Toklas. Courtesy of the Andy Warhol Museum. Creationism and the theory of the Big Bang operate in Western culture like a binary code. This is one reason why quantum supercomputers will be so revolutionary. Like those working within other fields, scientists often bring unexamined axioms to their positions in attempting to describe physical or even metaphysical reality. (The ’pataphysicist, on the other hand, subversively makes variables out of axioms.) Despite quantum mechanics and other breakthroughs that invalidate linear notions of spacetime as well as cause and effect, the theory of the Big Bang assumes in its fundamental question (how did the universe begin?) that time and space is linear. In the theory of the Big Bang, everything was created at a single point in space and time, and one outcome is that everything will end. As an origin story and narrative device, could the theory of the Big Bang be any more conventional? In a future commentary, I will be addressing the recent BICEP2 project and the apparent discovery of gravitational waves, which can offer new insights into cosmic inflation and quantum gravity. For now, I would like to consider some of the philosophical dimensions evoked by the theory of the Big Bang. What happened before the Big Bang? is an assumptive question, as is a related question, What does the universe look like from the outside? The notion of an outside in the context of the multiverse is moot when one considers, as Harvard University particle physicist Dr. Lisa Randall is considering along with her contemporaries, that our universe is a low-gravity universe compared to other universes in the multiverse. Write a poem that might exist in a low-gravity universe. That would not be assumptive. What happened before the Big Bang? “Everything that happened is always happening.”—Lyn Hejinian, Happily (Post-Apollo Press, 2000). Image I made of Beckett, The Blanchot Reader, Jarry's Ubu-Roi, an atom scaled into quarks, a fingerprint heart, and the tantric Dakini. To my mind, “The Invention of Zero” is a poem of lyric beauty as well as a serious inquiry into language, the concept of zero (in Sanskrit, zero refers to void), and how notions of emptiness, invisibility, and contained systems are represented in mathematics, philosophy, and beyond (“There is no sky/Enclosing this new world”). Similarly, Lyn Hejinian’s breakthrough essay and talk on poetics, The Rejection of Closure (1985), where she argues for the open text, suggests, to me, that the universe, like a poem, is not necessarily a closed text. Is the séance of the shore, the unsure.